The handling of cooled or frozen food puts high demands on the temperature chain. The Crawford 670 Inflatable Shelter SIB provides the optimal sealing of temperature controlled premises during the loading and unloading process. 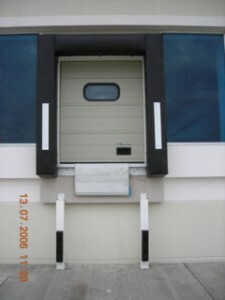 Contrary to other types of dock shelters, the vehicle dos not push towards the shelter. Instead, the shelter is inflated around the docked vehicle, providing complete sealing. The Crawford 670 Inflatable Shelter SIB is suitable for most vehicle sizes and the sealing capacity exceeds by far the standard normally required by operators. 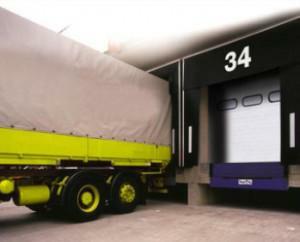 The food industry puts high demands on loading bay sealing in order to keep the cold chain as intact as possible. 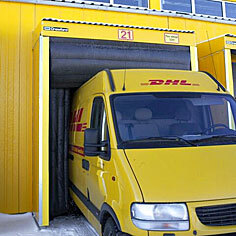 The dock shelter must provide continuous weather protection throughout the entire loading and unloading operation. Like a glove, the Crawford 670 Inflatable Shelter SIB tight around the vehicle, preventing air inlet. Customer demands are fulfilled! Simply set the selection switch and the relevant automation program is started. 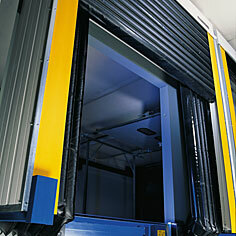 When set on “Small Vans”, leveller lip side tongues are retracted and the width is reduced to 1000 mm. At the same time, the down-force of the leveller platform is reduced by the unique hydraulic system. Just use the selector switch for return to standard lorry performance. The Crawford 670 Inflatable Shelter SIB is installed into a frame construction covered by insulated panels, giving additional insulation effects. The design facilitates easy and fast component exchange, should this be needed. The side and top inflatable airbags are made of impact resistant material with a strong, woven core. It is non-flammable, colour stable and highly resistant to weather impacts – in other words a material well suited for optimal function in rough docking environments.